Hello it's Sue here and very excited to be sharing some sneak peeks of the new stamps and paints from Lin Brown ! You may have heard, we have new paints. You loved the first collection of limited colours, so we have new ones for you. 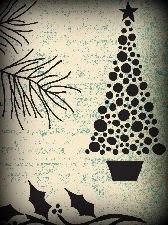 Lin has designed some fabulous plates for you, here is a sneaky peek. 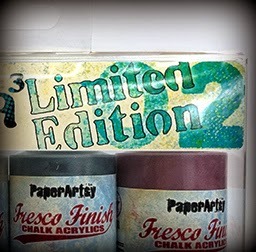 All new stamps and paints will be available from your favourite paperArtsy retailers very soon. Please do support them. 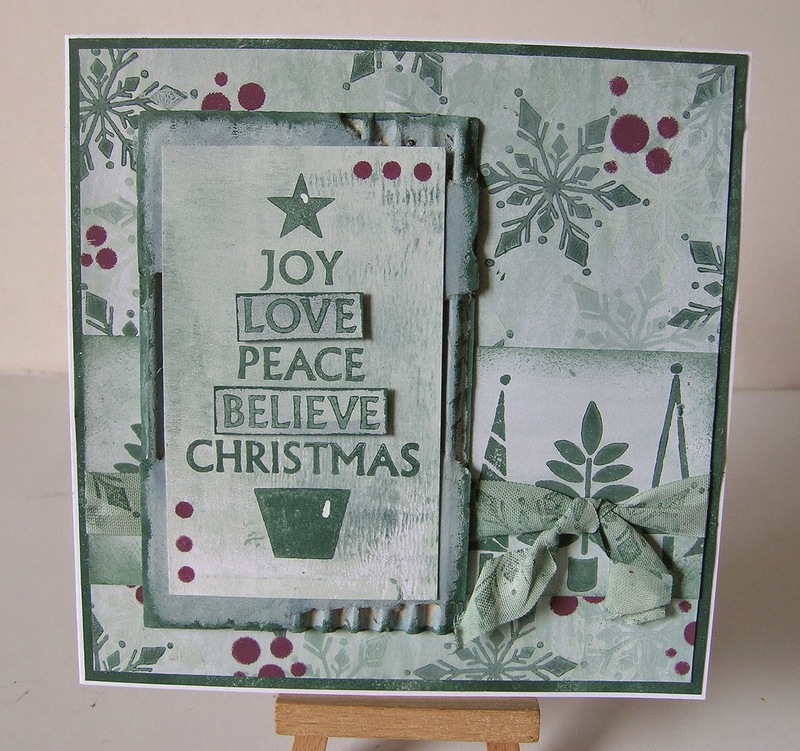 I started by stamping the snowflake from the ELB10 set with Hint of Mint Fresco Finish onto Smoothy card, I then used the same colour to do a wash over the card. I stamped the snowflake again this time with Evergreen Fresco Finish and also stencilled some dots using Plum Fresco Finish using the Lin Brown 001 stencil. I then used one of the new stamps from the Lin Brown ELB10 set to create a row of little trees, stamping them with Evergreen Fresco Finish. I cut a small piece of cardboard and ripped off some of the top layer and painted it with Hint of Mint and Evergreen Fresco Finish. I then used my brayer with the same two colours on a piece of Smoothy card and stamped the main image using Evergreen Fresco Finish. I stamped the words again and mounted two of them on some foam pads. The ribbon is seam binding that I've coloured usin Hint of Mint and Evergreen, watered down. When it was dry I stamped the snowflake on to it using Evergreen Fresco Finish. I added a little white dash on the pot and star to finish. 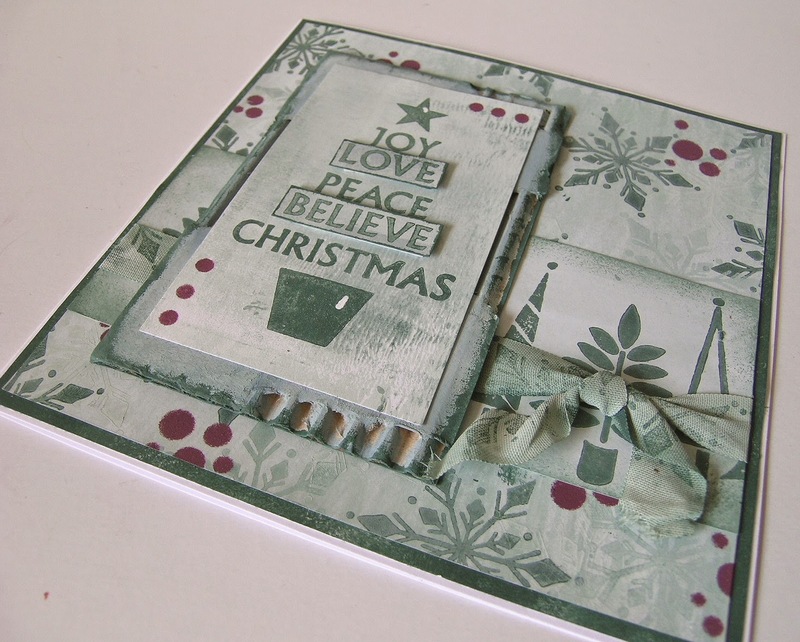 I started this card by using my brayer again this time using Marlin and Hint of Mint Fresco Finish on some Smoothy card. 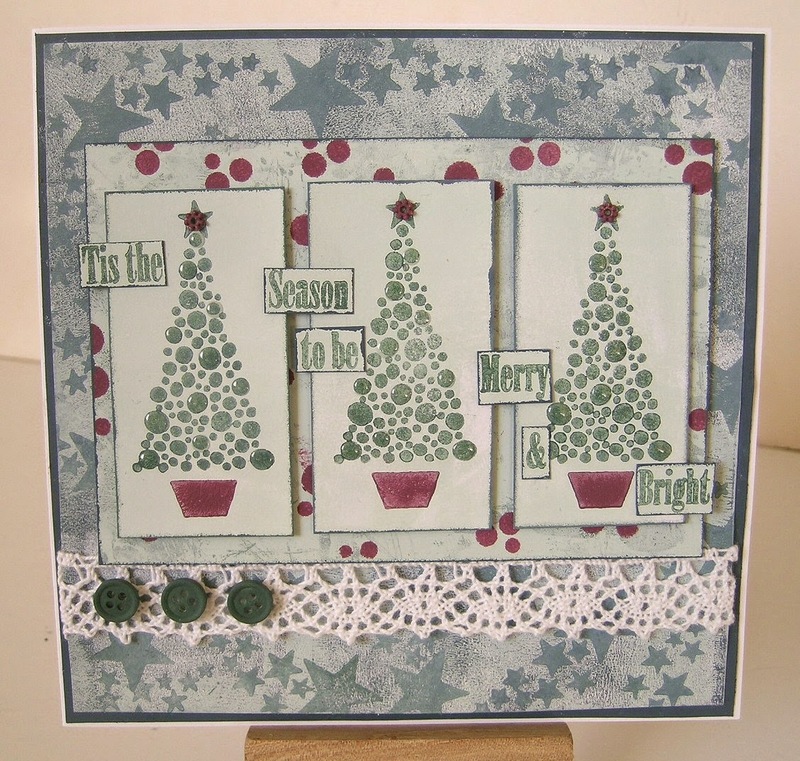 I then used the little star stamps from the Lin Brown ELB10 stamp set using Marlin mixed with a little Hint of Mint. For the panel behind the trees I wrapped some cord around my brayer and used Evergreen Fresco Finish then I brayered over the top using Hint of Mint. The little dots are done using Lin Brown's 001 stencil with Plum Fresco Finish. I stamped the little trees using Plum and Evergreen Fresco Finish onto some Smoothy card that I'd painted first with Hint of Mint Fresco Finish. The words are from the Lin Brown ELB12 set and I've cut them up to fit. I added some crocheted lace and painted the buttons with Evergreen Fresco Finish. To finish I added 3 little beads to the stars, which I've painted with Plum Fresco Finish, and dotted some Glossy Accents onto some of the dots on the trees. This is definitely a first for me making Christmas cards in August, but I loved every minute ! A huge thanks to Sue from all at PaperArtsy. Sue you did an awesome job with these stamps, not easy to get into the festive spirit this early but you did these stamps proud. Using only limited colours and images you have created lots of interest and depth. I am sure these will kickstart some Christmas countdowns. Come on people get started on your card lists..
Gorgeous card, Sue - I love Lin's new stamps- the only reason I didn't grab some on Sunday, was because they're Christmas stamps (I don't "need" any new ones but that won't matter come October/November when I start my cards...) maybe next month! Two gorgeous cards. I love the new paint colours, they're definitely on my wish list. Definitely got to have those gorgeous new colours asap! 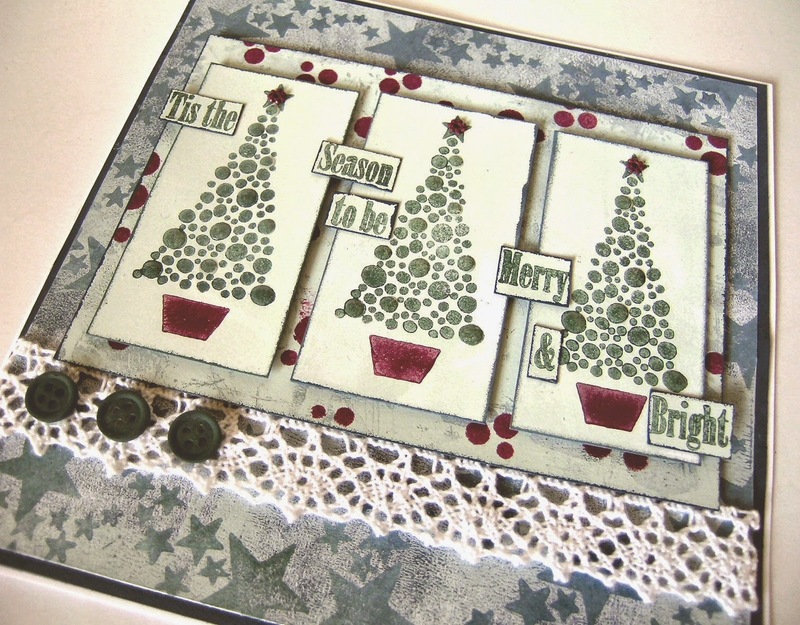 Love the stamps too and the cards you created are a beautiful blend of modern and shabby chic. Love them! Lovely Sue, I bought Lin's paints at Stevenage and lots of other stamps will get Lin's stamps soon! !